Peanuts are both a fruit and the seed of a peanut plant. The fruit includes the shell which is the rind of the fruit. The seeds are the two edible fleshy nuts inside and contain the embryo or baby plant. Peanuts are dicots which have two embryonic seed leaves. The nuts split in half at germination and produce a seedling. Peanut germination is a perfect illustration of plant initiation. Peanuts form under ground connected to the root system while the plant flowers above ground. 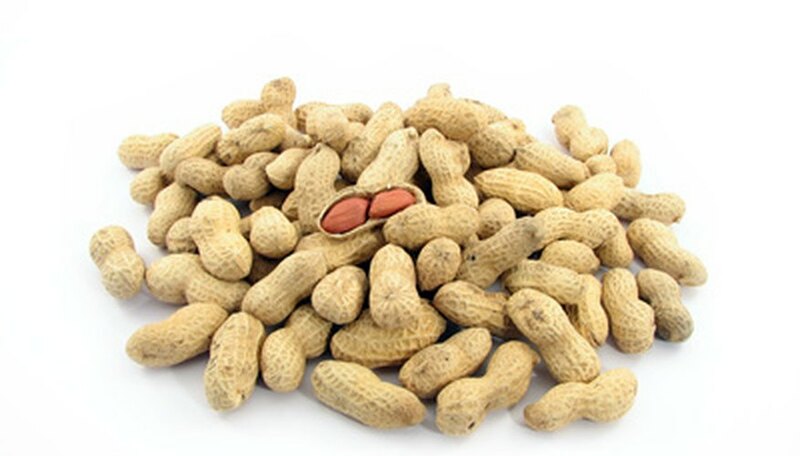 Peanuts are legumes which come in either bunch or runner types. The goober needs at least 120 days of growing season before the fruits are produced and ready. Soil temperatures required for peanut germination are at least 65 degrees Fahrenheit. When peanut flowers are fertilized and pollinated they produce a stalk-like appendage called the peg which grows downward and penetrates the soil in about 10 days. This is the beginning of the peanut fruit formation. Fruits form and mature in nine to ten weeks. Farmers use machines to sow peanut seeds. The field is well amended with organic matter and tilled to a depth of at least a foot. Gypsum and calcium are important additives to peanut fields. Sowing is not done until the temperatures of both soil and air exceed 60 degrees Fahrenheit. Peanuts are only a warm season crop due to the necessity of a long growing season. Seeds can germinate in seven days and there will be signs of a small leaf within a day after germination. Initiating germination on peanut plants requires the right combination of moisture and warm soils. To simulate perfect conditions and get the seed to germinate quickly you can start the nut inside. The peanut is removed from the shell and then you soak it for at least 12 hours. Then you put the soaked seed in a plastic bag wrapped in a moist paper towel for a couple of days in a warm place. Check the seed often until the outside starts to split and a tiny green bit forms at the end. After enough moisture has penetrated the seed it will split and push out a pair of plumules which become the cotyledons and a root shoot. The shoot elongates downward as the cotyledons lengthen upward. The surrounding tissue in each half of the peanut provide food for these growth processes. The seed coating begins to dissolve and the food inside is used up as the root sends out peripheral roots and grows hairs that will gather nutrients and moisture. Flowering proceeds after the plant is a month or more old and then the pegs begin to grow. When the fruit is ready for harvest it can be dug up with a pitchfork and pulled off the pegs.